The construction process is where the Contractor and his Subcontractors will deliver the project as outlined in the Scope of Works, drawings, Specifications , Programme and the Contract. All Planning Conditions , Fire Safety Certificate , Disability Access Certificates as required will be dealt with and submitted along with all fees, contributions etc payable by the Client. 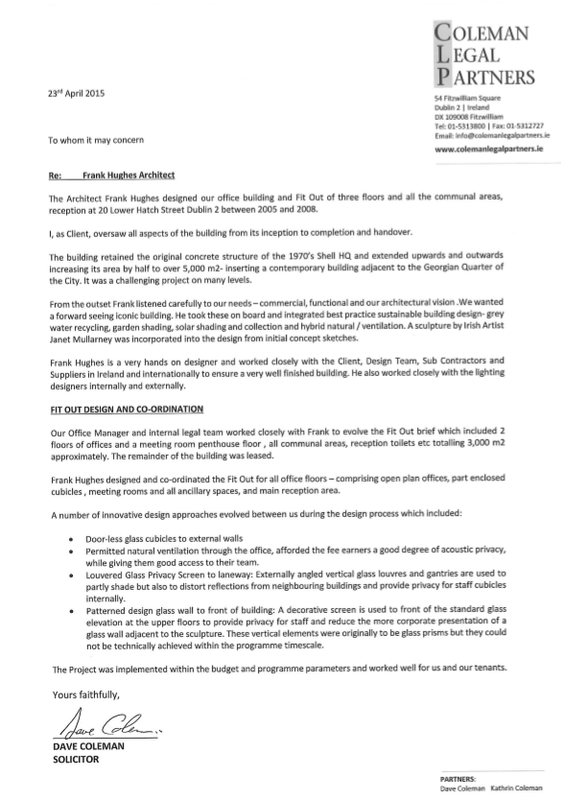 A Site Commencement Notice is issued to the Local Authority in advance of the works commencing. The Contract contains the rules of engagement for both Contractor and Client and deals with all issues such as Insurances, Contingencies, Use of Client Artists and Craftsmen on site, Programme, Delays and Payment terms usually monthly.It also deals with retention monies as a percentage retained until a period of 6 months as a precaution to deal with any latent defects not apparent at handover. The Design Team will submit any additional construction details as required to the Contractor for construction. The Architect administers the contract on behalf of the Client and must act fairly in dealing with all issues arising. This is done through regular Site Inspections and Site meetings, where the Design team ( as required) , contractor and client are present and whose minutes are circulated to all concerned with agreed Actions and timescale for completion. The Design Team will carry out inspections at appropriate intervals to ensure that key works are executed correctly . The Contractor has full responsibility for the programming and supervision of all works on site to meet with the design specifications and Building Regulations and Health and Safety requirements. To insure that their Insurance Broker vets and approves the Contractor and Client Insurances for the course of the project. 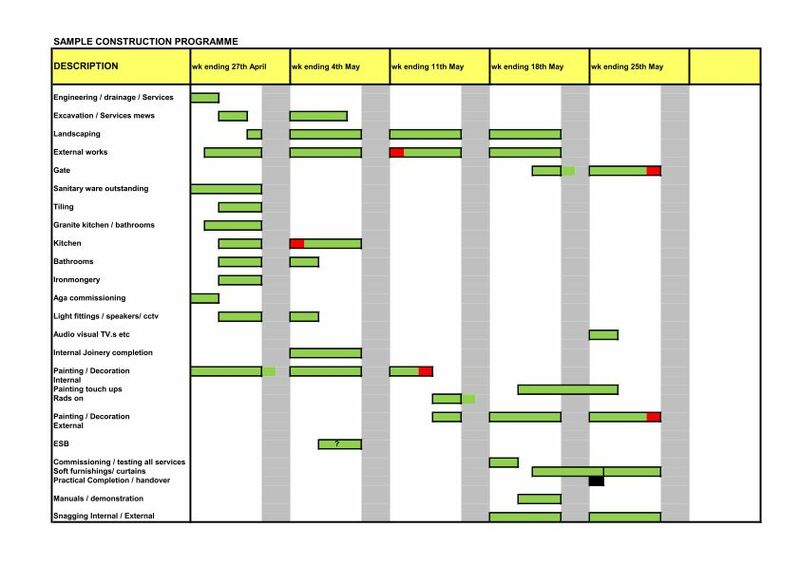 To ensure that all Client Directly sourced items are ordered in time to meet the Contractor’s programme and copy contact details to Contractor. To respond to cost or design issues raised on site – unforeseen or otherwise and make decisions promptly as necessary. To pay the Contractor in accordance with Contract following a Recommendation for Payment from the Quantity Surveyor and Certificate for Payment by Architect. To attend site meetings or delegate a person to attend site meetings in order to make prompt decisions on issues arising. To respond promptly to queries in Meeting Minutes to progress the project and programme. Client will agree any changes and the Architect will issue a written Instruction to the Contractor to carry out the works. Contractor submits his Valuation of works completed and monies due. The Quantity Surveyor inspects site to assess the quantity of work claimed for . The Architect / Design Team inspect site and agree quality of work complete . The Architect issues a Certificate for Payment to the Client. The Client pays the Contractor the stated Sum. The overall Contract Sum for the project is displayed on the Certificate for Payment along with percentage of work complete. Fees due to each Design Team member are pre-agreed with Client in advance of Project commencing and these fees are paid accordingly to the specific work stages. Variations arise where through unforseen circumstances ( example: hidden well requiring additional foundations not accessible / visible during site investigation ) or Client changes of specification or design on site. The manner in which these are to be dealt with is outlined in the contract and will be noted on a Materials and Labour / Time basis in the Bill of Quantity provided by the Quantity Surveyor. Some Variations edit out certain elements and others add in additional items. These are dealt with as a record of Omissions and Additions which add/ subtract from the Contract Sum.These are updated in each payment claim by contractor. It is very desirable for all design decisions to be made before going to site as design modifications carried out in the course of sitework can add unnecessarily to the overall cost of the project. While well run and managed sites rarely result in disputes , there is always scope for misinterpretation in communication .Disputes should be avoided at all costs and any issues dealt with swiftly.Some delays are caused by bad weather or unforeseen events. Under are some examples of the type of issues which can cause disputes and which should be avoided. Design team in delay on providing details in good time for construction. Damage / noise/ dust to adjoining properties. Contractor or Client Suppliers not performing and causing delays. Architect and Design Team Inspection of completed works. Sign off by Gas and Electrical Supply Companies. The Client’s Insurer is contacted to change the Insurance back from the Contractor to the Client. The Retention Sum ( percentage of the Contract Sum) in the contract is reduced , retaining monies for a fixed period to cover any latent ( non apparent) defects in the building. The Final Account is prepared including all Additions and Omissions over the course of the Contract and agreed. Final snagging ( minor defects in mostly finishes) is completed and agreed. In practice additional snagging may be carried out once the building is occupied. Before The Defects Liability Period ( for non apparent defects , usually 6 months) is finished – the contractor contacts the Architect to carry out the final inspection. On successful completion of this , the remaining retention monies are released to the Contractor. In the event that there are defects, the Contractor will be given the opportunity to fix them. If he choses not to , another company can be paid to carry out any remedial works.